It was a short ferry ride to the next of many islands, Java. Only 1/3 the size of Sumatra, but 143 Mio. people compared to 50 Mio. but failed when i found myself in a 20 km traffic jam because people went for a long weekend and a truck got stuck in the mud blocking both lanes. I was actually going the opposite direction of the traffic jam, but both lanes had been taken over by people who thought they could overtake some other cars and then never found a spot on their lane again (or they just didn't care). So a lot of it i had to ride on the side of the road, through private gardens and standing traffic, it rained a lot, so all turned into mud and got really interesting. Unfortunately no pictures. 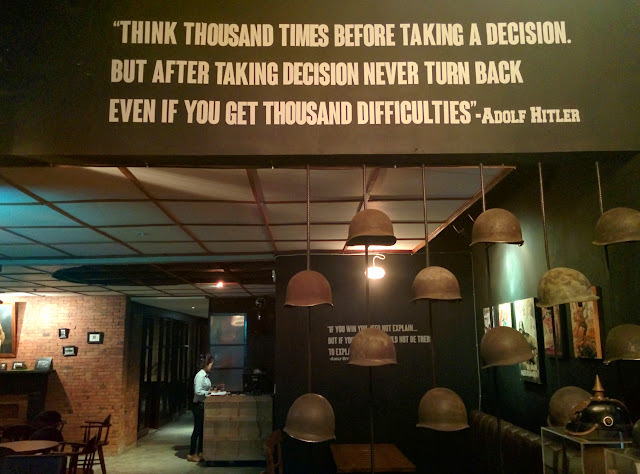 A few days in the crowded Art-Capitol Bandung, where i had a drink in the "Soldatenkaffee", named after a German military cafe in WWII’s occupied Paris. There were many articles about it in German and International media. When the owner opened it the first time it didn't take long till he got the first death threats and subsequently closed the establishment. About 2 years later it reopened, less offensive, more educational. 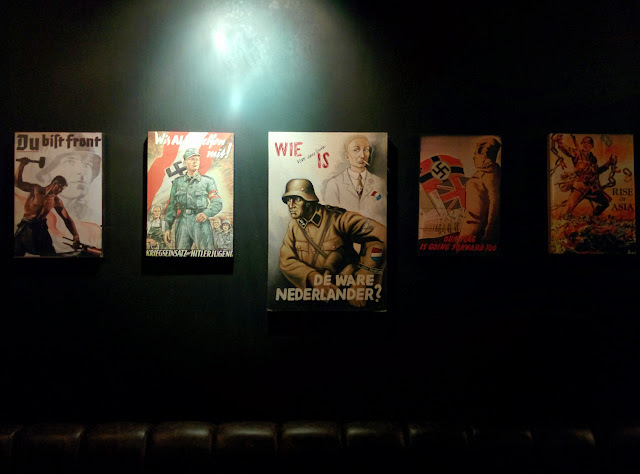 One has to understand that in many South-East-Asian countries Hitler is seen as a great conqueror, this is how the youth sees it and to my knowledge this is what they get told in school. Westerners are often surprised by the lack of knowledge about these wars, but how many know about the Khmer rouge and Pol Pot for Example? so i would not enjoy it at all and feel bad the whole day for spending that money. With an extended visa in my passport i said goodbye to my programmer friend Daniel and continued south-east, direction coast. 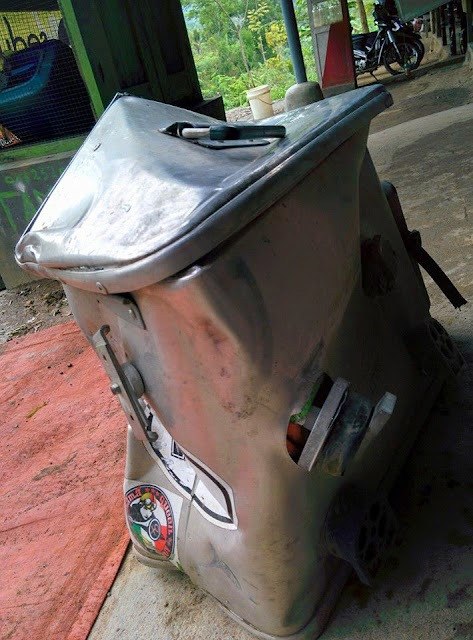 Not exactly "roadworthy" for western standards, but even Indonesian police was giving them a hard time (well, there is nothing that can't be solved with a few $$$). 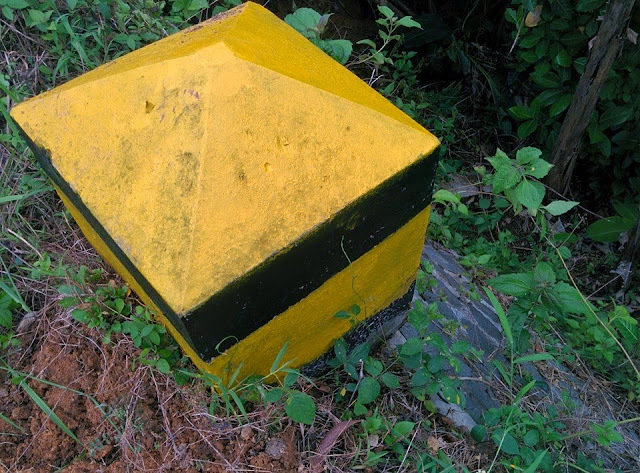 I found a place for the night and took off the next morning, had a great time riding a beautiful mountain road till all of the sudden a truck-driver decided to crash his truck into my right pannier. To explain the situation, i was going uphill @~60km/h just after a sharp bend, even being on the left side of my lane (left-side traffic in Indonesia), a small truck came the opposite direction neatly driving on his lane as he suddenly pulled right and straight into me. I assume he wanted to use my lane to drive the bend with higher speed and completely overlooked me. Sight was perfect though. It ripped off my pannier and crashed the bike, only coming to a halt about 20cm before a several meter drop. Lucky me. The "stopper" is a joke, it just moved together with me and the bike. I was basically unharmed, a few bruises where i hit the ground, nothing really. 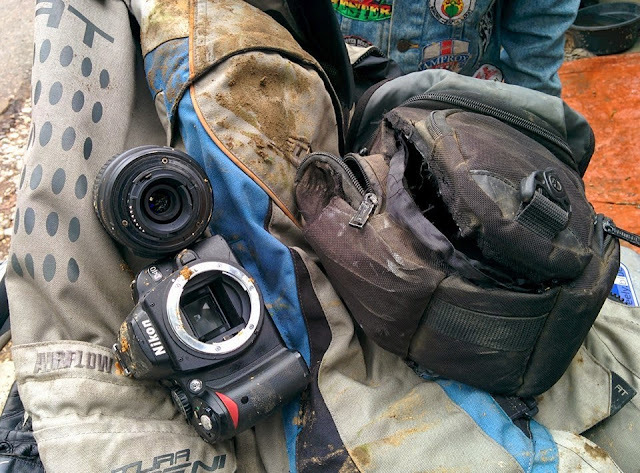 Had the Nikon attached to the front of the pannier that got hit. It still worked, but you had to hold everything together, mounts were broken. This is the driver, as expected he could not speak a single word of English, but at least he stopped and did not flee the scene. He also spent the next 4 hours with me trying to hammer the pannier back into shape and provisionally attaching it to the bike. Unfortunately the rack on the bike was also bent, it took me several days (and attempts) to get things into an OK state. I also lost most things inside the "kitchen pannier", some things could be bent back (my pots), but others were beyond repair. I took a day off (sitting in a hotel room watching tv series) and continued my trip. The highlights of Java were yet to come. 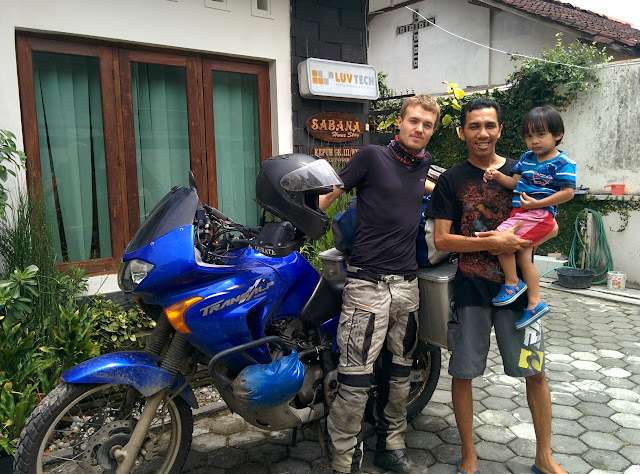 When i left the crater i met a group of Chinese/Indonesian people with offroad-bikes, buggies and proper 4WDs. The owner of these, a wealthy businessman, invited me to stay in his guesthouse, which i happily accepted. After a few days i continued east to Gunung Ijen (Ijen Volcano), which turned out to be my favorite experience on Java. It's a volcano complex that has sulfur mining in operation. Sulfur-laden baskets are carried by hand from the crater floor to the next village, miles away. it's a very toxic environment, but nobody has proper gas masks etc. The walk up the crater is not the easiest, loose ground and a bit of jumping from stone to stone, these guys do it with up to 100kg on their shoulder! Most workers do the whole trip 2 or 3 times a day, each time taking several hours. The weight of around 80-90kg on their shoulders destroys their body, most have a dis-allocated collarbone, a constant open wound and other things. 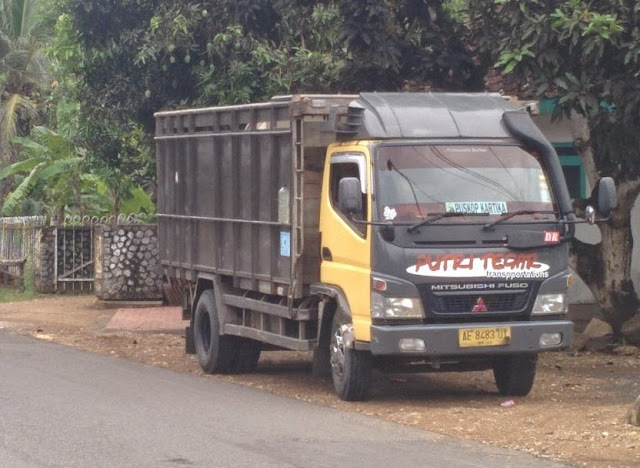 They earn about 150.000 rupiah (~10 Euro) per 100 kg Sulfur that they deliver. Who thought his job is hard? Another ferry and i reached Bali, where i mysteriously can't find a single picture right now. 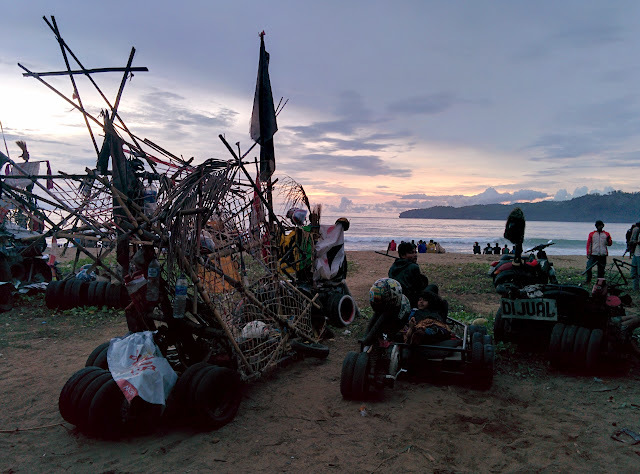 It is certainly not my favorite island for traveling, way too many people (locals and tourists alike) that jam the few roads that exist, party-tourism and much higher prices. But i had to get some work done, so it was a nice, easy place for that matter. 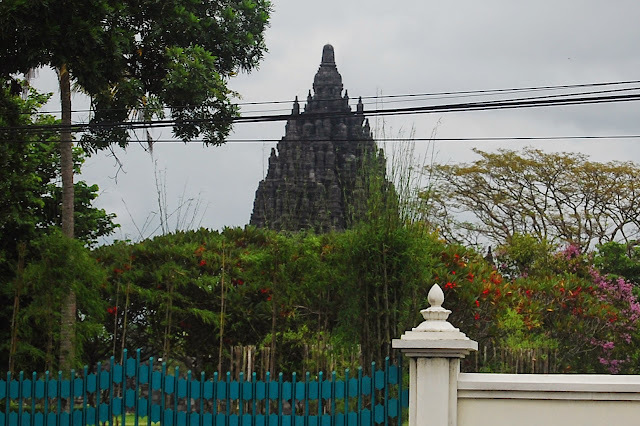 Also worth noting is that Bali is mainly Hindu, not Muslim, which made for a nice change. Anyway, next ferry, this time a rather rough one -> Lombok. 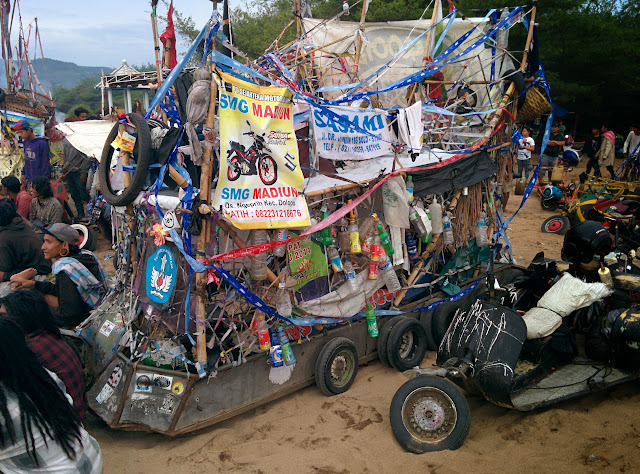 The next Island i sat foot on was Sumbawa, very different, very quiet, basically no tourism, a good very scenic highway that runs trough it, a lot of horses and nice people. 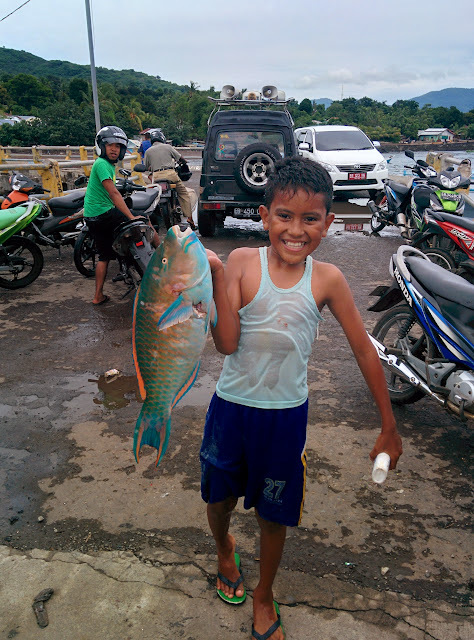 Leaving the port of Sumbawa, on to the next island, a very special one, Flores! It was a nice warm night, no cloud in the sky (later on). I put my sleeping mattress on the top deck and slept under the stars. 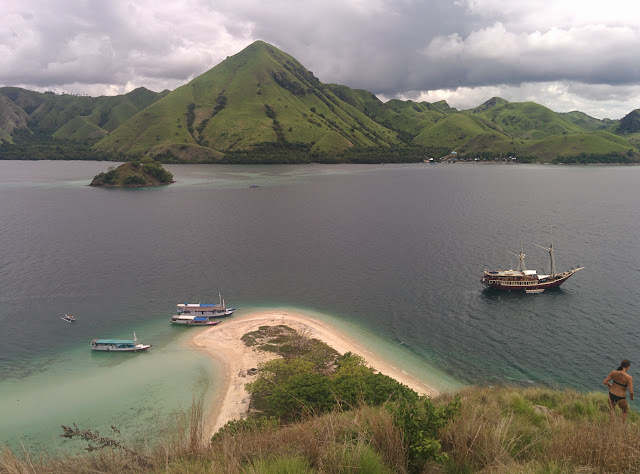 Flores is famous for the neighboring Komodo Island, that inhabits dragons. Dragons? On the way to Rinca Island where the dragons live, a bit closer than Komodo, but with the rough sea this time of the year often the only choice. "When hunting, Komodo dragons rely on camouflage and patience, lying in bushes or tall grasses until a victim passes by. They pounce on their prey with powerful legs and sharp claws, then sink their jagged, shark-like teeth in. An animal that escapes the jaws of a Komodo won't feel lucky for long. Dragon saliva contains large amounts of bacteria, which poisons their victims, usually within 24 hours. Dragons will calmly follow their bitten prey for miles, using their keen sense of smell to find the corpse. They have huge appetites and have been known to eat up to 80 percent of their body weight in a single feeding." One has to walk around the island with a guide, for protection. If their stories are true then this is more than justified. A few people (locals) die every year because of dragon attacks they said. even dragons prefer the beaten path! There is one highway trough Flores, a beautiful paved road in good condition. In Asia the rural kids that are slightly older than their brothers/sisters always seem to get into a caretaker role very quick. Almost never I've seen kids fighting which each other. Well, there is not much to fight about anyway. They have a simple but very happy childhood in my opinion. 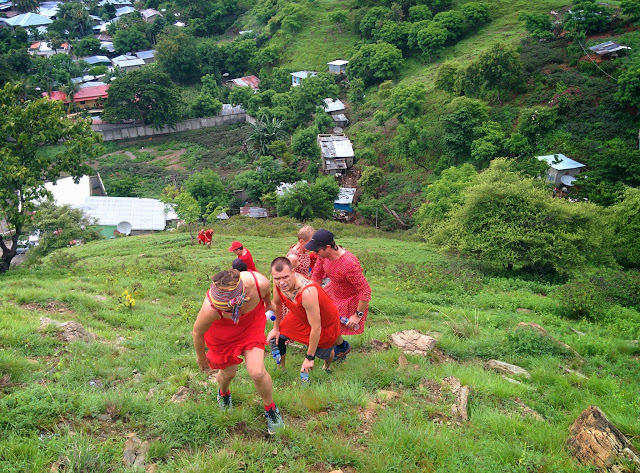 Bena, a traditional village on the foot of Mount Inerie. Unfortunately turned into a tourist attraction (but no mass-tourism here). Luckily though there were other villages, less impressive on the picture, but more authentic. By the way, due to the colonization of Flores by the Portuguese in the 16th century, it is Roman-Catholic, not Muslim. 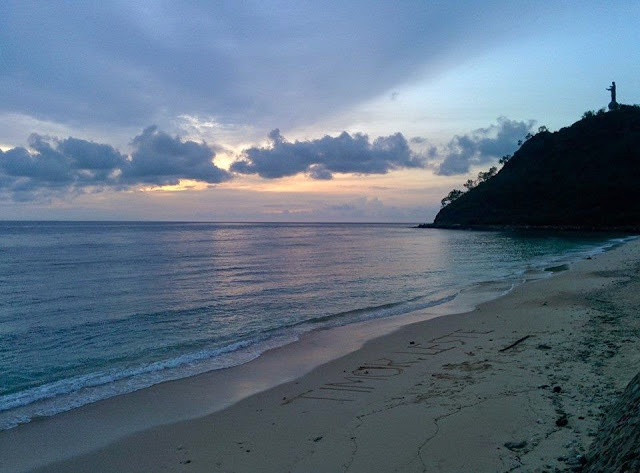 One of the nicest beaches I've ever found, except for two fisherman nobody there. 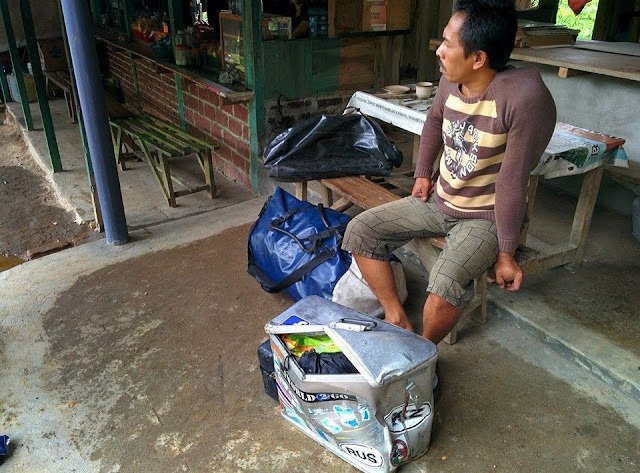 I met a few travelers on Flores, some been there before and told me they got Malaria when they came the first time. Indeed, Flores is a higher risk level than the other islands that i crossed before. The incubation period of malaria is about 7 to 30 days and the Test is quick and easy i got told. 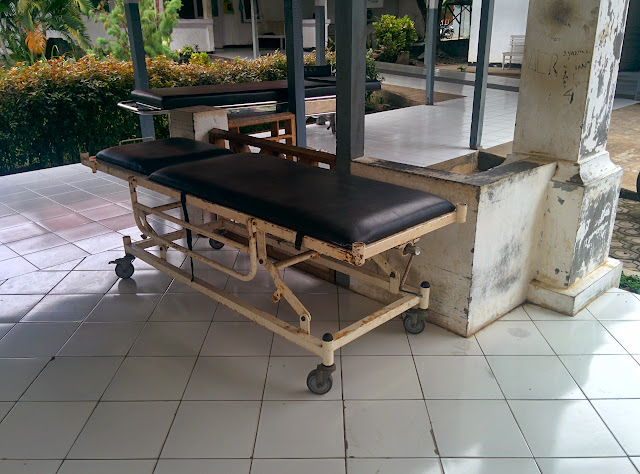 Arriving at the very east of Flores, in Larantuka, i decided to just quickly do that test in the local government hospital. Enough to make me scared, they gave me a prescription for 2 different pills and a basic guidance how long/often to take them. Not many people spoke English up there, so i did not feel that it would be a good environment to try out some pills there (the price of 0.50 euro for the pills did not inspire confidence either). 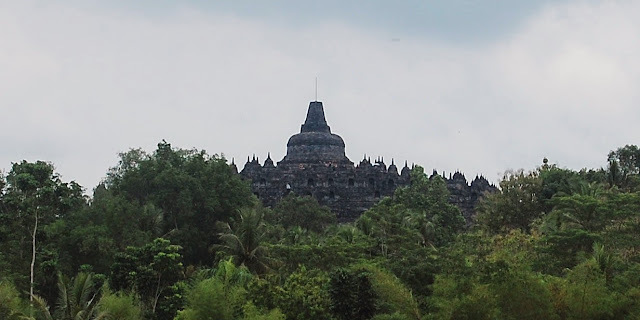 I checked all i could online, sent a mail to my insurance and my uncle who luckily is a doctor, in the evening i went to the travel agent in town to check for flights to Kupang, where they recently opened an international hospital. First they said the airplane would be full but then one seat got vacant while i was still sitting there, already handing my passport over to book it, Vonny, the owner of the shop told me there would be another hospital in town, which might be a bit better. She also spoke very good English, so i got more confident to stay in Larantuka and take those pills. Over there i was greeted by 10 friendly nurses and one Chinese doctor girl, younger than me. They did another test and told me i don't have Malaria. ...Lessons learned, always double check, especially in rural Asian hospitals. 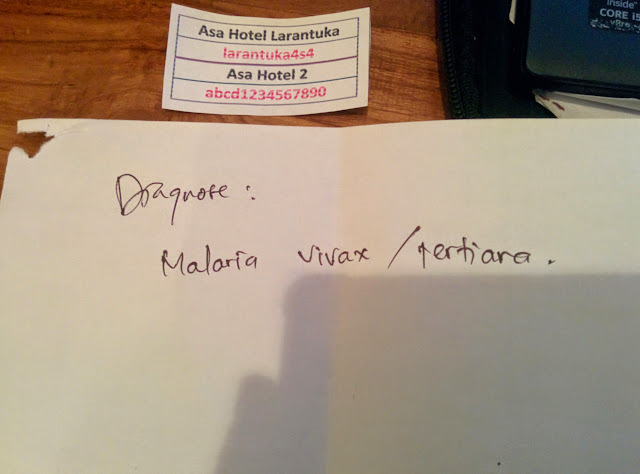 Last thing, Malaria is in fact not a very serious disease anymore if you know it early enough, there are good pills, for the non-severe Malaria Vivax and also the severe Malaria Tropica. Still many people (mostly kids) die from it, because they don't get the pills. I had to wait quite long for the next ferry, it only goes 3 times a week, but was canceled many times due to bad weather (in rainy seasons it often happens that it doesn't go for a month). A 12h crossing, the longest so far. Many bikers did not talk very highly about these ferry connections, but they crossed in high season when boats are completely overloaded and it's difficult to find a space to sit. 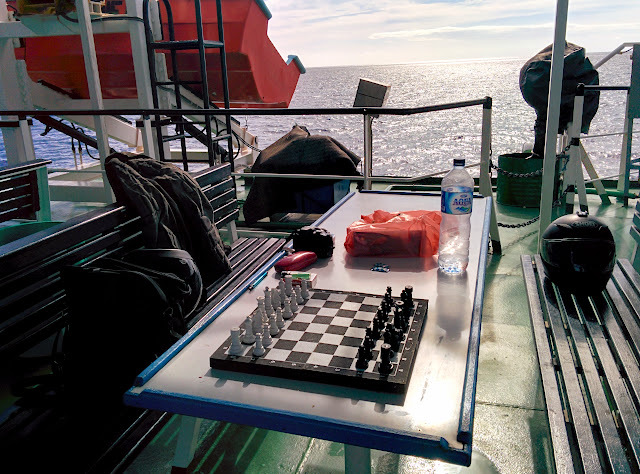 Not so in off-season, i always had the deck more or less to myself, even a round of chess with a fellow biker was possible. I enjoyed all of the ferries very much. 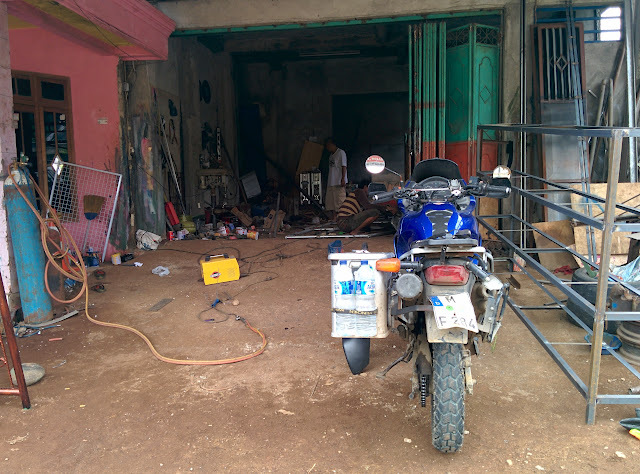 In Kupang, West Timor (still Indonesia), i went to a proper Laboratory and checked a few things (wanted to have a 3rd opinion on that malaria stuff). I also had stomach pain for almost all the time in the for 4 Month in Indonesia, thought i give it a try to find out what this is. I did not find out much (all good basically), but Irma, the English speaking nurse that took care of my case showed me one of her favorite places in Kupang, a snorkeling spot under a fish farm out in the sea, very nice. While probably being the poorest country in Southeast-Asia, it is also the most expensive one. The currency used is US$, which makes it worse if your bank account holds Euros these days. "On 30 August 1999, in a UN-sponsored referendum, an overwhelming majority of East Timorese voted for independence from Indonesia. 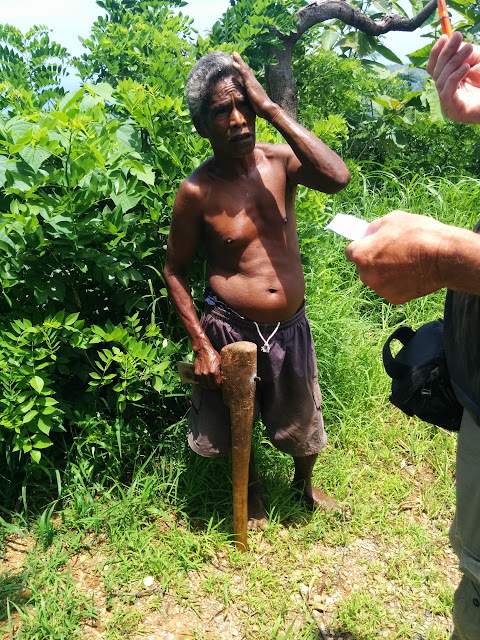 Immediately following the referendum, anti-independence Timorese militias — organised and supported by the Indonesian military — commenced a punitive scorched-earth campaign. 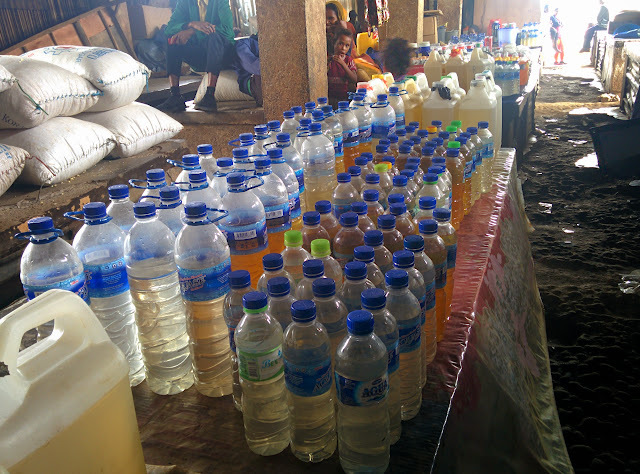 The militias killed approximately 1,400 Timorese and forcibly pushed 300,000 people into West Timor as refugees. The majority of the country's infrastructure was destroyed during this punitive attack." 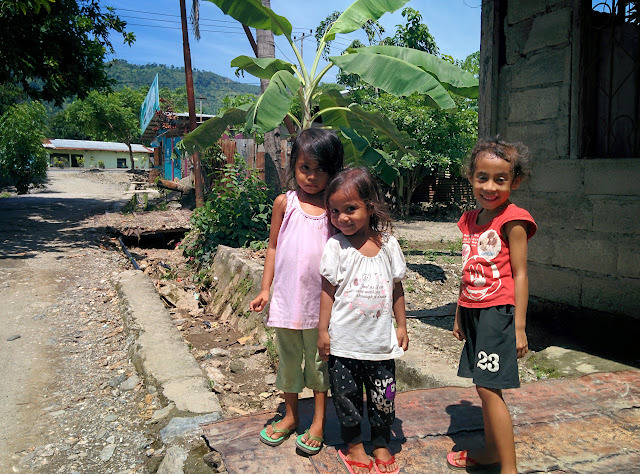 Even now in 2015, most of Timor Leste's Infrastructure is destroyed. 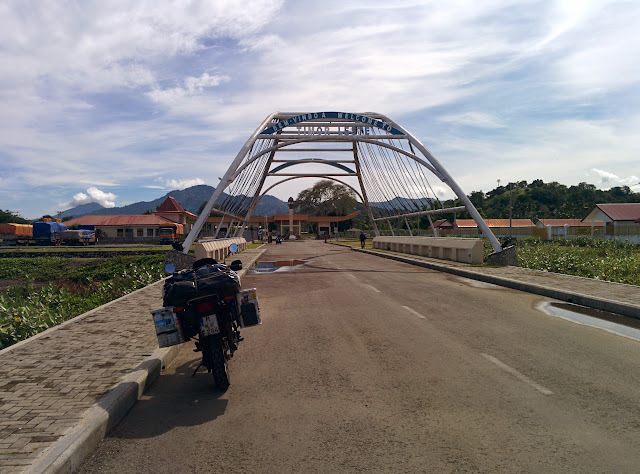 Roads are in terrible condition, but the ride from the border to the capital Dili is one of the most breathtaking coast rides ever. 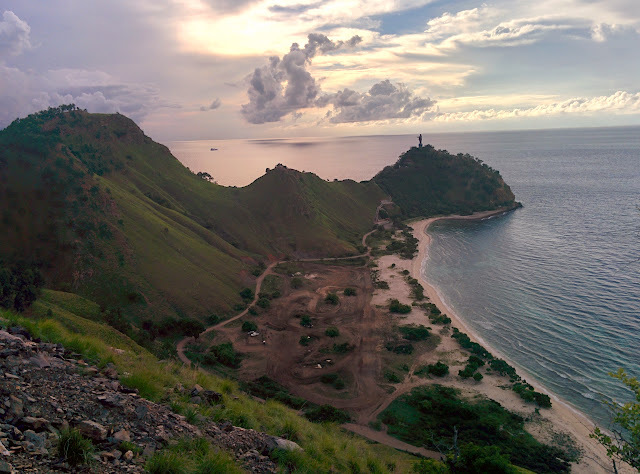 Cristo Rei beach dili, motorcross track, second highest Christ statue in the world, world-class snorkeling, no tourism, a real paradise! On the way to a geocache in the mountains. The local booze, Arak. You never know if you will get blind or not. 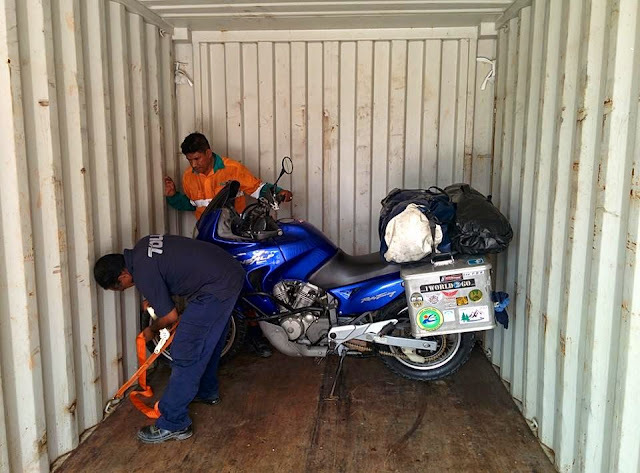 To bring a motorbike into Australia, it has to be 100% clean, no dirt or insects anywhere. 7 full days toothbrush job. If Australian Quarantine finds something it can get really expensive. Will i pass? Blue getting strapped into the container, it was about 50 degrees in there! 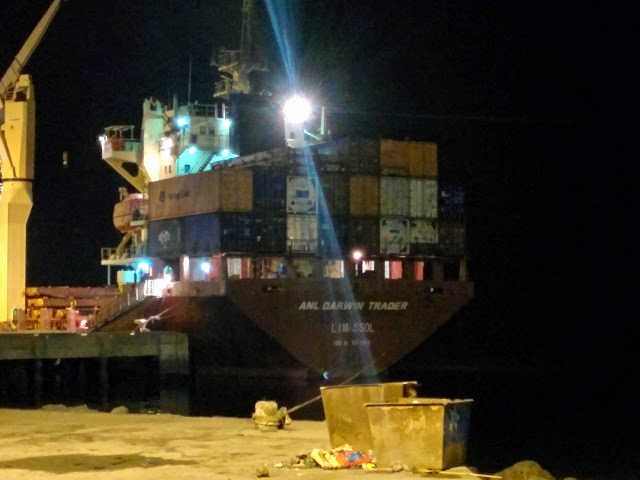 My bike left on the ANL Dili Trader, but it's the same type of ship. A few weeks without the bike, i had to get myself something to do. 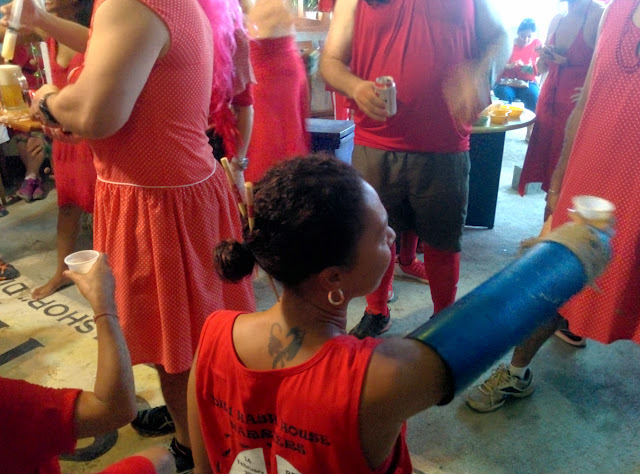 I finally attended my first Hash House Harriers run. 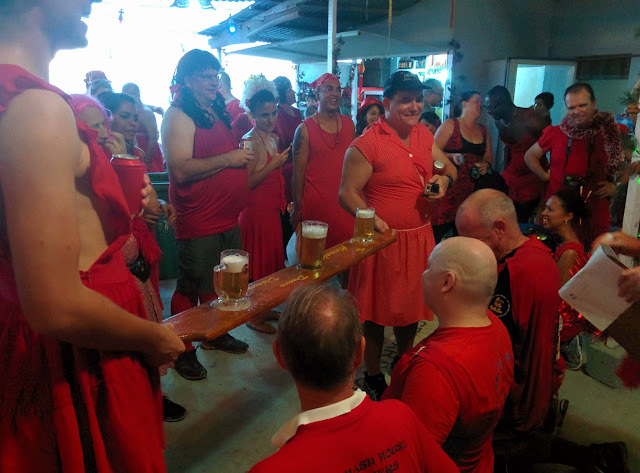 The hash house harriers are in almost every bigger city around the world, basically it is a drinking-club with a running problem. During the run are checkpoints, where you fill up with free beer and a bit of water if you need/want. I need to cut this post short now, have to catch my ferry to Tasmania today. It's winter and freezing cold, but i really wanted to visit this Island of Australia. 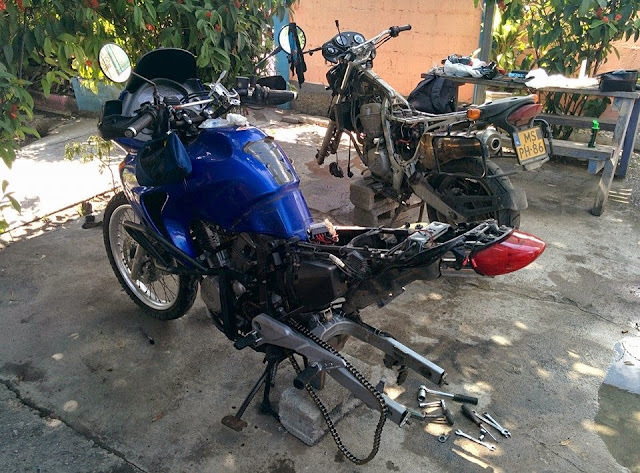 I spent about 3 weeks in Timor-Leste, most time in Dili, i really loved it. There is almost no tourism and so much to explore.